Just a couple months after LG debuted the capsule-based, Nespresso-like, beer-brewing LG HomeBrew at CES 2019, the company showed off an ice cream-making rendition at the SXSW Conference in Austin, the Snow White. On Saturday, LG announced that the company would be using their first ever appearance at the SXSW Conference to give "festivalgoers a sneak peek at future product concepts being developed to transform the way we live." 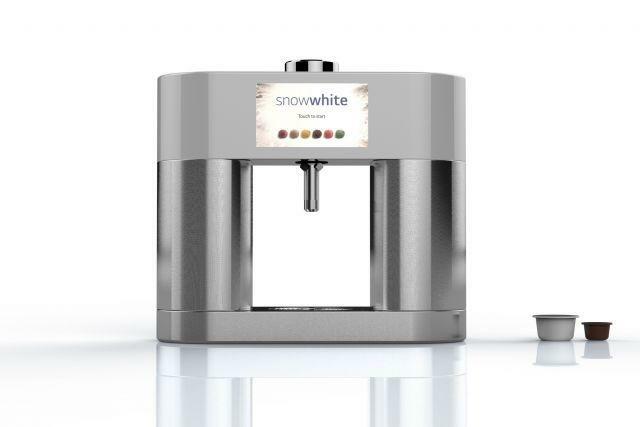 On that list of life-changing products, you'll find the Snow White, a Nespresso-inspired ice cream maker that can "brew" individual servings of ice cream, gelato, frozen yogurt, and other forms of frozen desserts. This invention comes just a couple months after LG unveiled the HomeBrew in December, a similar pod-based personal countertop appliance that brews beer instead of coffee. The Snow White, on the other hand, requires two pods to be used per churn -- one for your flavor selection and the other for your texture preference from "traditional ice creams to sorbets to gelatos, even frozen yogurts." For now, like the HomeBrew, the Snow White ice cream machine is only in the prototype stage, and there's no word whether or not the appliance will ever hit the consumer market. In any case, we're looking forward to whatever pod-based food or beverage machine LG will come up with next.